below (L to R): Patricia Doyne and Jan Hagan. Reception: Saturday, May 20, 1–3 p.m.
11 a.m.–3 p.m. and by appointment. Participating Artists: Kay Athos, Shari Benson, Barbara Berner, Michelle Boire, Michelle Bond, Carol Jones Brown, Andrea Ciak, Amber Crabbe, Harlan Crowder, Susan Deming, Philip Denst, Molly Dolly, Patricia Doyne, Don Drake, Ulysses Duterte, Rochelle Elias, Jason Engelund, Raymundo Enriquez, Howard Fong, Shelley Gardner, Richard Geiger, J. M. Golding, Jan Hagan, Mercie Harris, Ann Maloney-Mason, Keeley McSherry, Qingjian Meng, Helene Miscovich, Allison Murdach, Allie Phillips, Sandra Regan, Durba Sen, Stan Stadelman, Nancy Starr, Ruey Syrop, Alani Susan Taira, Gerald Thompson, Winifred Thompson, Monica Tiulescu, Ain Veske and Gege Xu. Get ready for our juried annual exhibit! Open to all artists. Hand deliver entries to the gallery on September 14 and 16. Entry form and more details will be listed soon. Christine Koppes has assisted in organizing and curating a number of exhibitions as Assistant to the Curator at the Bedford Gallery. She has worked on a wide range of contemporary art exhibitions, including those that have traveled nationally such as BLOW UP: Inflatable Contemporary Art and Cut Up/Cut Out. Koppes also assists with the City of Walnut Creek’s Public Art Program and organizes the annual Craft Fest event at the Bedford Gallery. Prior to the Bedford Gallery, Christine Koppes worked for the Asian Art Museum in San Francisco, CA. Koppes studied at New York University and University of California, Berkeley where she earned a BA in Art History. Reception: Saturday, March 25, 1–3 p.m. Participating Artists: Sameera Amiri, Jagroop Atwal, Christina Barsetti, Celso Borba, Sylvia Chavez, Kyle Childress, Geswin Ching*, Katelyn Chun, Marty Coleman, Robert Cross, Jimmy Falcon, Donald Fields, Thien Hoang, Beth Jones, John Laspina, Olivia Magana, Alex Magana, Tom McBride, Monica Munoz, Kara Music, Danny Nouque, Maureen O’Donnell*, Mark Ortins*, Marjorie Robles, Melany Rodriguez, Jeannee Rosenblum*, Natalie Shomon, Pablo Suarez, Jennifer Sullivan, Gilbert Walling, Kim Weatherton and more! More information about: Sorensdale Recreation Center. Thanks to Bruce D. Roberts for the following write up of Looking Forward, the A.R.T., Inc. Members Exhibition. Come see it before it closes this Saturday! 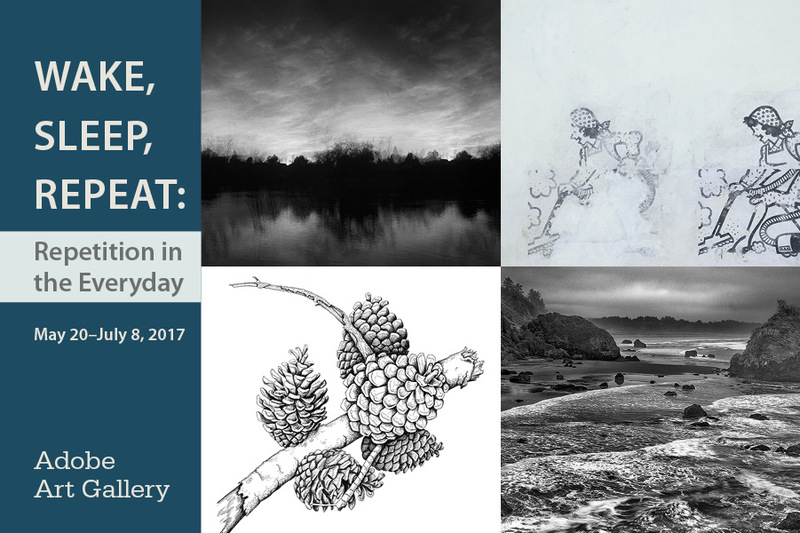 From January 21 to March 4, art fans everywhere have a wonderful opportunity to see the breadth of talent and style of East Bay artists. Fifty-seven artists have brought their works for display to Castro Valley’s Adobe Art Gallery. The results are amazing. As Dorothy in Wizard of Oz sings out “Lions and tigers and bears, Oh My,” art lovers touring this gallery will be tempted to shout out, “Acrylic and Watercolor and Oil, Oh My!” And that’s just the beginning. Photography, ceramics, pencil and mixed media are thoroughly in the mix. Even more esoteric art terms such as “bromoil,” “gessoed,” “encaustic,” and “Prismacolor” help to fill out the span of these artists’ abilities. The talent abounds here. Marie Kulka’s “Early Morning Fog Glow” is a panoramic and strikingly beautiful view of the bay at dawn. The acrylic “Lady,” by Lee Daguman evokes beauty and depth through a faceless but feminine hair style hovering amid vibrant splashes of color over a small, singular female silhouette. Using simple white pencil on black paper, Doyle Wegner created “Morning Serenade,” a fiddler arousing life outside a bedroom window. Kathleen Hardwig, from the local “Botanical” painting group, brought a “Red Flowering Gum” branch to life with watercolors, but no green—the many natural shades of green created through expert use of other colors. Winifred Thompson’s “Sun” would be impressive enough as a painting, but by molding Halloween “netting,” saturated with glue, then painted over with oil and pastel, she built up the rays, the sea, the shoreline cliffs to add texture and dimension to this explosion of light. This was a “judged” exhibit, with several works receiving Awards of Merit or Honorable Mention, plus cash rewards. But the overall quality of the work seems so high that the Judge, Angela Johal, must have had a very difficult task. All in all, this is a very impressive display: “Looking Forward,” an A.R.T., Inc. Members’ Exhibition at Castro Valley’s Adobe Art Gallery from January 21 to March 4, 2017. The Adobe, at 20395 San Miguel Drive, is open Thu-Sat, 11 a.m. to 3 p.m. Or call (510) 881-6735 to view by appointment. Awards were announced at the A.R.T., Inc. Looking Forward reception on January 21, 2017. Angela Johal selected Awards of Merit and Honorable Mentions. Image details (L to R): Kay Athos, Stanley Stadelman, Gerald Thompson, Nick Calarco and Alani Susan Taira. Adobe Art Gallery invites A.R.T. Inc. Member Artists to submit work for the A.R.T. Inc. Members’ Exhibition entitled Looking Forward on view January 21–March 4, 2017. New this time an online entry form! Please review the form early and direct any questions to Adobe Art Gallery Director, Leah Virsik at: adobegallery@haywardrec.org. Saturday, January 21, 1-3pm. Please bring a snack to share. Exhibit open Thursday–Saturday, 11 a.m.–3 p.m. between January 21–March 4, 2017 and by appointment. $10 to A.R.T. Inc. for a single entry. Angela Johal will select equal value awards of merit to be presented at the artist reception. Her artistic portfolio is filled with variety. Angela likes to use recycled material, found images and objects to create her compositions. She also works with line and color to configure hard-edge geometric paintings. She has a BFA from San Jose State and exhibits throughout the Bay Area. See her website for images and more information. Hand deliver work to Adobe Art Gallery, 20395 San Miguel Avenue, Castro Valley, CA. Include with your submission a label listing Artist Name, Title, Media, and Price or Value, Phone and Email. Attach label to the back of 2D work or base of 3D work. Write up this information on a slip of paper or download an artwork label on the gallery’s forms page. Please bring an artist statement about your submitted work and a resume for insertion into plastic sleeves for the artist binder. Entry is limited to a single entry from the first fifty (50) A.R.T. Inc. Members who submit their entry form, fee and artwork with label at the gallery by the deadline. Members who have submitted artwork for publicity are given priority. Saturday, March 4, 3–5pm. Pick up your work at the gallery during this time. All artwork must remain on display for the duration of the exhibition.